Allows players to own, operate, and coach a football team by simulating a single season or dozens of seasons. Professional Football Simulator is a text-based simulation game for the PC from Barcode Games. 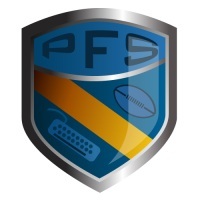 PFS allows players to own, operate, and coach a football team by simulating a single season or dozens of seasons. Players are in complete control of many team functions, including player drafting, free agency, roster moves, lineup setting, and play calling. The game allows significant customization of leagues including choosing from many popular league formats, financial models, and both modern and historical teams and players.